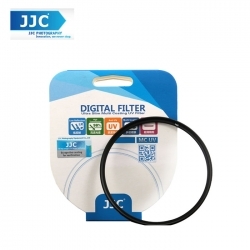 JJC A+ F-MCUV Series Ultra Slim Multi-Coated UV Filter is effective to absorb ultraviolet light. The filter is designed with 6 layers of coating on each surface to reduce internal ghosting and reflections. The average light transmission is not less than 99.5%, which provides you with high color fidelity. The filter is constructed from Japanese optical glass and a precision milled aluminum frame. Hardness of the filter’s glass is up to 9HD, which provides additional protection in case of drops or situations where scratching could occur. Moreover, this filter features an incredibly slim design that the glass measures just 0.03" (0.7mm) thick, and the frame measures 0.12” (3mm) thick, helping to minimize the likelihood of vignetting. The aluminum frame has a matte finish on the surface and is corrosion-resistant. It is complied with the ROHS standard that is limited by European Union. The front of the frame is designed with thread for attaching lens cap or other accessories. The filter also helps to reduce dust and moisture from reaching your lens element. The filter is useful as a general protective filter to leave on lenses at all times.